There are a lot of factors that come into play with warehouse placement. Choosing the most appropriate location is crucial to its ability to bolster your global business. What is your motivation for expansion and how do you plan to achieve it? Every company has its own reasons for extending its business reach to new markets. Whether they want to increase the volume of business by offering more products, outfitting more customers, boosting brand value via favorable locations, or capturing a new market, they are all driven towards one goal: growth. Based on your objectives and budget, you can acquire or rent warehouses in places that best suit your needs. For example, if you are a small manufacturer, having your warehouse closer to the manufacturing plant increases the effectiveness of your manufacturing by ensuring a steady supply of raw materials to the plant. If, on the other hand, you are a multichannel seller, acquiring a warehouse at a well-connected hub in an area of high demand will translate to improved customer service and reduced freight costs that are associated with order fulfillment. As you do your research and shop around for locations, make sure to keep your expansion plans in mind, as the way you choose to expand can (and should) inform the place you put your warehouse. What kind of goods and services are you planning to offer? In addition to your expansion motivations, the type of goods and services your company deals in will also directly impact the location of your future warehouses. If, for example, your business deals in perishable or fragile goods, it’s best to have a warehouse that is closer to both the source of the goods and the market, in-order to reduce risk of spoilage or damages. On the other hand, goods that are potentially hazardous or corrosive need to be stored in more isolated locations, so as to avoid any unsafe contact with them. We can see how the type of goods sold determines the best warehouse location–which, in turn, impacts the success of a business–by taking a closer look at the sugarcane industry. Post-harvest, the amount of cane deterioration that occurs depends largely on a number of factors: the BHTCD(burn/harvest to crush delay, or the time interval between the harvest and processing of sugarcane), the prevailing temperature and humidity, and exposure to pests and diseases. Both growers and millers would benefit significantly if cane could be processed immediately after it is harvested. For example, in South Africa, there is often a BHTCD of three to four days. An increase in the BHTCD for growers who are further away from mills can cause increased cane deterioration, which leads to a poorer quality product. Thus, if you’re a seller of sugarcane, having your warehouse or mill closer to the farm ensures a better quality control over your product and benefits your business overall. The bottom line is, if you want to see improvements in quality control as your business grows, it’s important to keep your core products and/or services in mind when choosing a warehouse location. What are the regions you are looking to serve? Before you begin to expand your business to new locations, you have to know your target audience so you can figure out how to best use your facility to serve that market. The idea here is to identify suitable locations that will put you closer to your customers, both the existing and new, so that you can ultimately bring down your handling costs, freight costs, and order fulfillment times. In order to better understand how target markets and warehouse locations work together, consider the case of American Eagle Outfitters, a retail giant that was on the lookout for a new warehouse facility to improve their order fulfillment times and meet the increasing demand for their products. Studying their existing customer base, order profiles, and transportation and labor costs allowed them to conduct site assessments more thoroughly. They found out that the majority of their customer base, both online and in retail stores, was located on the East Coast. This information finally led them to acquiring an omni channel facility in the east, which has brought their business closer to their customers. Now, they’re able to increase the efficiency of their delivery process, fulfilling more than 90% of direct orders within a span of two to three days. This example clearly demonstrates one thing: taking a step back to survey your existing customer base and finding out more about your buyer concentration can really pay off when it comes to finding prime warehouse locations. Hence, the best approach would be to understand your current market while also surveying new markets to learn more about where they’re located, in order to acquire a warehouse at a location that is ideal for both your new and existing markets. What are your labor requirements and what’s the available labor capacity? When it comes to your warehouse workforce, or the team of people you’ll need to run your facility, factors like the number of skilled workers you need, your workflows, and the amount of time the facility will remain operational everyday all affect which locations are most appropriate for your business’ storage needs. One example of criteria worth considering is the development of the potential location for your warehouse–is this area rural, suburban, or urban? Each of these degrees of development can have a unique level of impact on your ability to attract new hires to your business. A warehouse that is located near developed areas or trading hubs has a higher chance of attracting prospective employees than a facility located in the middle of nowhere. Also, as you scout for favorable locations, check out the neighborhood to see if there are competitors in close proximity to your to-be-acquired warehouse, as this can also limit the availability of qualified manpower. It’s also important that you take the warehouse’s distance from some kind of hub of people into consideration–the farther your warehouse is located from civilization, the more you have to invest in providing ancillary facilities, such as distribution centers, as well as additional amenities for your employees to support their ability to work productively. These amenities can range from something as simple as providing snacks in the office, to much more complex and expensive incentives, such as home deposits, transportation to and from work, etc. Remember to keep these additional costs in mind when choosing a warehouse location; otherwise, you may find yourself burning excess cash on buildings and employee incentives that you can’t afford. Now that you know your objective, customer base, and items to be sold, it is time for you to look at the options available to you when it comes to setting up a warehouse. Acquire a private warehouse that is built for the storage of your goods. These warehouses can be tailored to the nature of the commodities to be stored. For example, cold storage spaces are built for keeping perishable goods like fruits, eggs, meals, vegetables, etc. Store goods in a public warehouse for a nominal storage fee. These warehouses are licensed by the state. Their methods of operation and rates of charges are controlled and regulated by the government. Furthermore, they are usually constructed at favorable points on railway routes and main roads, so that convenient transport facilities are available to you. Use the services of a bonded warehouse, which are licensed by the government for accepting of imported goods to store. They are under the supervision and control of the custom authorities of the country where they are located. The goods are released to the importers once custom duties have been paid. These warehouses are highly advantageous to retailers who import items from foreign countries, as they are required to pay duty only for the quantity of goods removed from these warehouses. Furthermore, they offer certain beneficial services such as bottling, racking and vetting liquid cargo, blending and labeling certain products like tea, and so on. Ultimately, choosing the best location for your warehouse is about more than the monetary factors; you need to find the best fit for your business. Make sure you do your research so you can transform your new warehouse into a valuable resource. Be clear about what your goals are for a new warehouse. If you know its purpose, you’ll have a better chance of finding the right place for it. Make sure that the new location is ideal for the items and service that you are offering or planning to offer. Your products impact the places that will work for your warehouse. Investigate markets and potential customers, and ask yourself what is the best place to have my warehouse so that it serves not only current markets, but also the surrounding areas? Your warehouse location needs to have long-term value for all your markets. Choose locations where you have a higher chance of finding the most qualified workforce for your business. Your warehouse won’t run itself; you need to make sure you’re located in a place that workers can readily access. And finally, make sure to simply keep your eyes open to what’s happening around you! You may be surprised to find that someone in the area might own a warehouse that can be rented and is perfect for your business needs. If building a brand new warehouse is not an option for you at this moment, keep your eyes open for warehouses that are available to be rented! You can find a feasible way of renting a facility that’s well-outfitted for your business before you build your own. 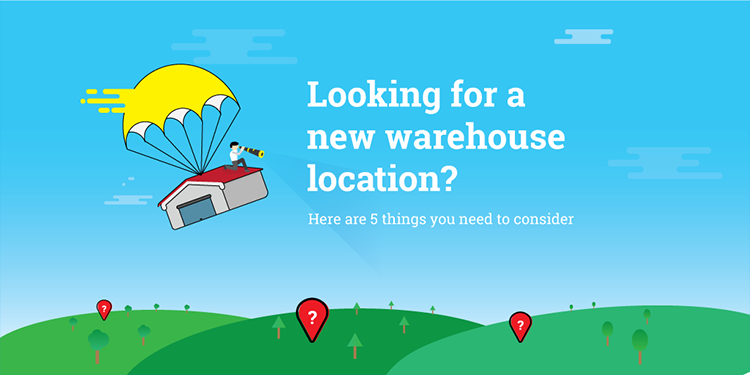 As long as you keep these tips in mind and do your research thoroughly, you’ll be able to find a warehouse location that best suits the needs of your growing business. Be sure to keep an eye out for the next article, where we will be discussing how we can optimize the items stored in our warehouse for a hassle-free experience.